Simulation games tend to have three speeds. Most often, they throw the player into the management role, where they oversee the entirety of the simulation from the outside, making adjustments where necessary. Secondly, there are flight sims—games that do their best to emulate all the minutia involved in making tubes of metal soar through the air (and sometimes space). Both of these flavours of simulation pride themselves on the thoroughness and accuracy on their simulations. Then you have the weird stuff—Beat Cop is part of that weird stuff. Beat Cop follows the story of a former detective who, after an arrest gone wrong, has been demoted all the way back down the totem pole to the bottom rung, i.e. a beat cop. On a dirty street populated by the dregs of New York City overrun by warring criminals, only you can hand out parking tickets and cordon off murder scenes. You’re truly the hero we all deserve. The universe has its roots in the over-the-top crime dramas of the 1980s, and the oppressive disillusionment prevalent in America following the Vietnam War. 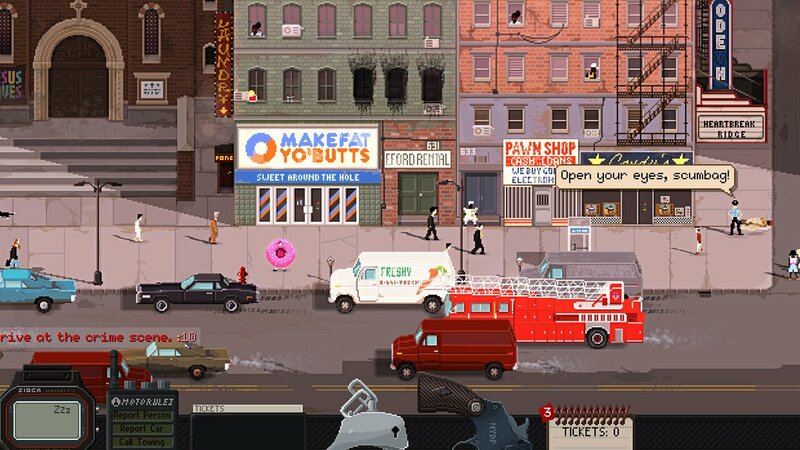 The game alternatively revels in the mundane side of life and absurdist black humour. You wouldn’t be far off comparing Beat Cop to 3909’s 2013 border guard simulation Papers, Please. 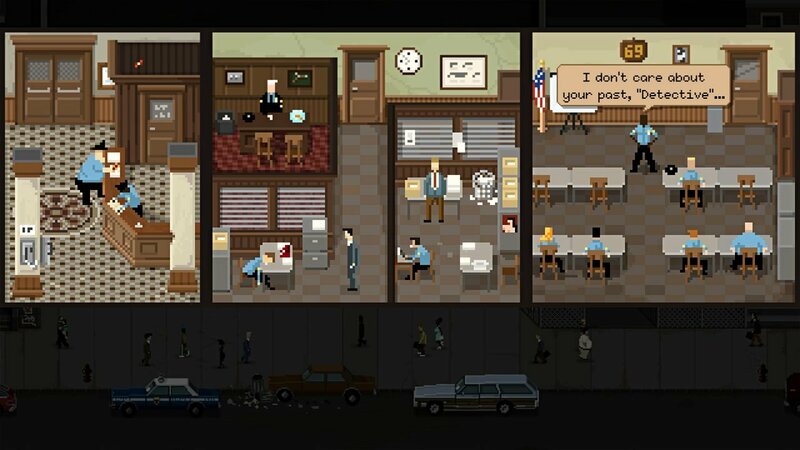 Both games employ highly stylized pixel art to evoke the feelings of a forgotten era, juxtaposing the clearly game-like visuals with gloomy, cynical themes as a way to make uncomfortable topics more approachable. Also, both games examine repetitive, boring extensions of faceless governments and question when their machinations are important to a society and when they are more problematic than helpful. Also, both games are genuinely funny. 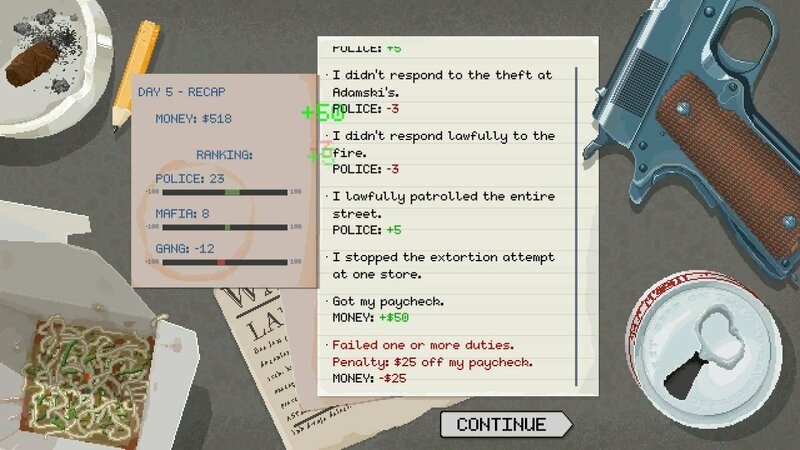 Don’t let this comparison scare you away; Beat Cop is nowhere near as cynical or oppressive as Papers, Please, and nowhere near as punishing. The gameplay loop is pretty simple. Every day you’ll be given a quota of how many tickets you need to hand out that day and what sort of tickets those should be. Additionally, you will usually be given an additional objective, such as walking your beat between certain times or keeping an eye out for thieves. From there you’ll be deposited on your street where you’ll walk up and down, examining tire treads, parking meters, and headlights as you make your quota and attempt to clear your name. While going about your duty you should also mind your relationships with the people on your beat as well as the local gangs, one of which is likely involved with the murder of your predecessor. When I first hit the streets, I ticketed every car that was in violation, letting the pleas and bribes of their drivers fall on deaf ears. Then I started to get to know the people I was protecting better, the priest who’s more involved than he should be, the friendly donut shop owner that always gave me a free snack, and I started to question this overzealous approach to peacekeeping; soon I started letting minor infractions slide, so long as the violator wasn’t offering a bribe or doing anything particularly heinous. These sorts of micro stories give meaning to the down time between each story beat. Speaking of story, the one here is legitimately interesting, but the game insists on drip-feeding everything to the player, regardless of their actions. I understand the thought behind this kind of storytelling, it’s meant to make you feel helpless due to the limitations of your position and build anticipation for the next piece of the story. Sadly, the story is often unsatisfying and too little to justify the frustration. All in all, Beat Cop feels like it might be trying too hard to get its point across to everyone. Despite this complaint, I love Beat Cop, but I definitely see where other players won’t like what the game is putting down. Its tendency to flip from comedic to cynical without much warning could be a bit arresting for players the first time or two. However, for players that can find enjoyment in the black humour and the not so subtle satire, there is a lot here to enjoy. Beat Cop is a quiet little indie game and punches way above its weight in terms of presentation, theme, and fun.